2Limited strictly to the wound bed due to limitations of the sponge/pad and VAC Device. 3Tanaka T, et. al. Negative pressure wound therapy induces early wound healing by increased and accelerated expression of vascular endothelial growth factors. Eur J Plast Surg (2016) 39:247-256. Limited to VEGF. 4Various chenokine, cytokino, and growth factors are intrinsic to grafts/applications and are introduced into the wound bed. However, these products don't appear to stimulate additional growth factor generation. 5dermaPACE® FDA Clinical Support and Device Description, January 2018. FDA de novo clearance as Class II device on December 28, 2017. 6Blume PA, et. al. Comparison of negative pressure wound therapy using vacuum-assisted closure with advanced moist wound therapy in the treatment of diabetic foot ulcers: a multicenter randomized controlled trial. Diab Care (2008), Apr; 31(4):631-6. Epub 2007 Dec 27. 8Apligraf FDA Summary of Safety & Effectiveness Data, June 20, 2000, as proxy for cellular matrix. 9GSA Scheduled total cost of equipment rental, use, consumables and labor @ $30/hr. 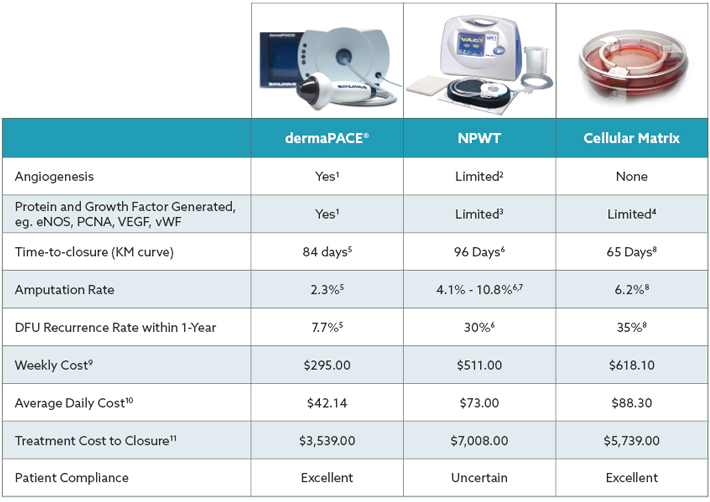 dermaPACE® labor component is insignificant and not noted. 10Weekly Cost divided by 7. 11Average Daily Cost times Time-to-closure, above.